The holidays are quickly approaching, so that means holidays parties. 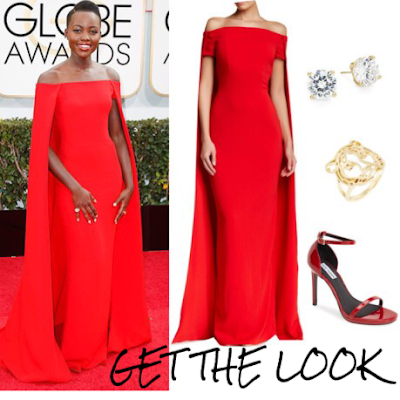 At the 2014 Golden Globes, Lupita slayed the red carpet (but when doesn't she?) in this red Ralph Lauren gown. I found a dress similar to the one she wore at Nordstrom Rack and Hautelook; the dress comes in black, red, white and green. Her look also goes with the cape trend that all the designers are putting into their collections. So if you are planning to attend a lavish holiday party or gala, consider this look! See the Deals of the Week page for additional sales!